Smart style with easy access to your favourites. Knock twice on the tinted glass InstaView Door-in-Door panel to see inside the easy-access door without letting the cold air out. The Door-in-Door feature allows you to get in and get out providing easy access to beverages and snacks. Equipped with ColdSaver Technology, cold air loss can be reduced by up to 47% which means your food stays fresher longer. Stylishly spacious. If you think a fridge with top-of-the-line features means sacrificing style or space, this will make you reconsider. With nearly 25 cu. ft., this 33-inch wide refrigerator has the largest capacity in the market and features a tall water dispenser with an ice system that actually frees up shelf space. Along with that, and much more, you get the peace of mind of a 10-year warranty. Its the refrigerator with something for everyone. 24 cu. ft. 3-Door French Door Refrigerator with InstaView Door-in-Door in Black Stainless Steel - ENERGY STAR® Smart style with easy access to your favourites. Knock twice on the tinted glass InstaView Door-in-Door panel to see inside the easy-access door without letting the cold air out. The Door-in-Door feature allows you to get in and get out providing easy access to beverages and snacks. Equipped with ColdSaver Technology, cold air loss can be reduced by up to 47% which means your food stays fresher longer. 24 cu. 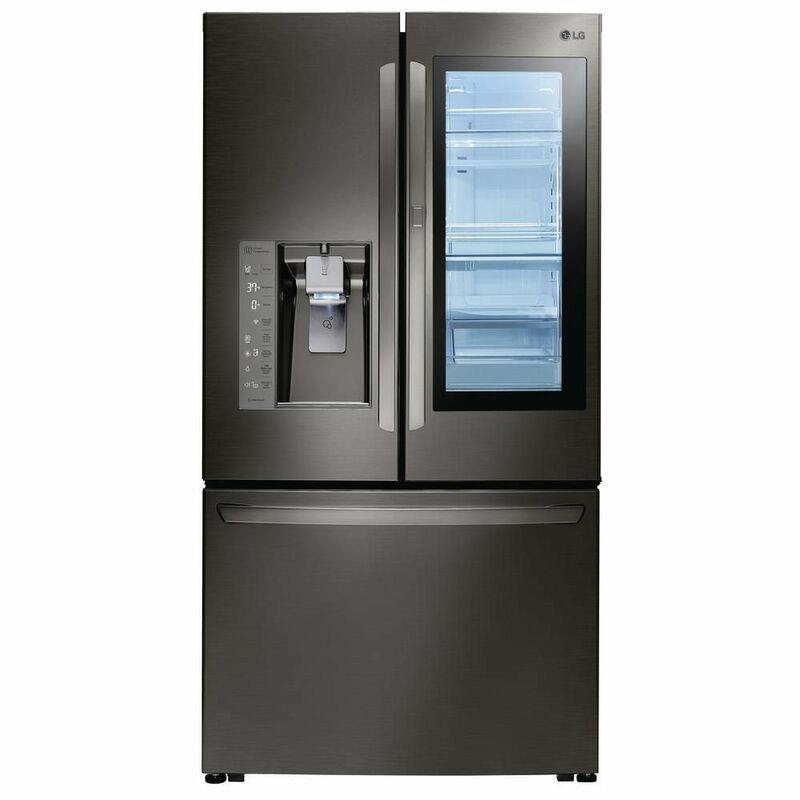 ft. 3-Door French Door Refrigerator with InstaView Door-in-Door in Black Stainless Steel - ENERGY STAR® is rated 4.6 out of 5 by 232. Rated 5 out of 5 by Mel from We’ve had the refrigerator for a little over a week... We’ve had the refrigerator for a little over a week now and love it. It looks great! Rated 5 out of 5 by JJJr11 from Works great, looks good, & quite.... Works great, looks good, & quite. What type of water filter is compatible with this refrigerator? I have a scratch on my fridge. Do you sell touch up paint? If so, can you please tell me what it is and where I can buy it? Thank you! I apologize, but no; we do not carry touch-up paint for any of our black stainless steel items. What type of filter does this fridge have for the water/ice? If there any information on how much and which types of contaminants it filters out? Is this model fingerprint resistant? We appreciate your interest in this refrigerator. While it is certainly possible to purchase the door, it is recommended to have the installation performed professionally, as improper installation can result in air leaks around the seals. Parts and accessories can be obtained through our parts distributor, MCM Electronics. Their contact number, for placing orders, is 800-824-9491. You can also use their website, at http://www.mcmelectronics.com/content/en-US/forms/lg_parts. We regret the trouble you have experienced with this refrigerator. If the dispenser is splashing water, then it may be suggested to utilize a taller container from which the water will not so readily splash. It may also be possible to reduce the water pressure from the water valve by decreasing the water flow from the valve in the wall.